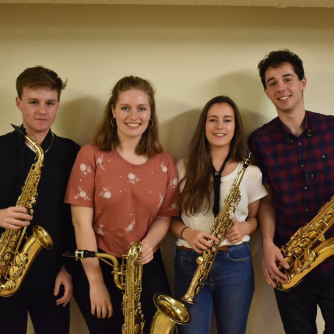 The Phase Saxophone Quartet are a young, London-based saxophone quartet, recently formed at the Guildhall School of Music and Drama, where its members still study. They specialise in Classical and Contemporary repertoire, as well as bespoke arrangements of Pop tunes and music not originally written for Saxophone Quartet. They enjoy playing in a wide range of contexts and styles and are thrilled to be playing at Music in the Castle 2018!